Difference between revisions of "Turning Sand Into Golden Gate Park"
When the idea of Golden Gate Park was first hatched, in the mid-1860's, the whole world scoffed: Everyone knew that the western half of San Francisco was an arid wasteland of [[Animals of the Dunes|barren sand dunes]], upon which nothing could be made to grow. The ''Santa Rosa Press-Democrat'', in 1873, wrote: "Of all the white elephants the city of San Francisco ever owned, they now own the largest in Golden Gate Park, a dreary waste of shifting sand hills where a blade of grass cannot be raised without four posts to keep it from blowing away..."
Fortunately, San Francisco ignored the conventional wisdom and set about the task of creating America's finest urban park. The two chief requirements were fertilizer and water; the latter was piped in and distributed with the help of the [[Windmill|Dutch Windmill]] that still stands by the ocean near where John F. Kennedy Drive hits the Great Highway, while the former was provided in the form of the copious droppings generously bestowed upon the City's streets by the drays who were, until the 1920's, the mainstay of the local transportation system. Though no reliable estimate of the amount of horse-excrement collected for park fertilizer exists, the total undoubtedly ran into tens, even hundreds of thousands of tons. 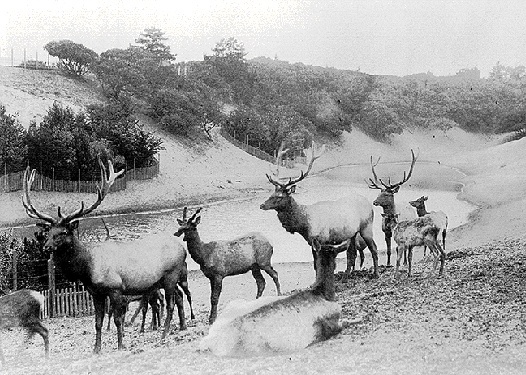 1899: deer meander through what is today the AIDS memorial grove between Middle Drive and Bowling Green Drive. 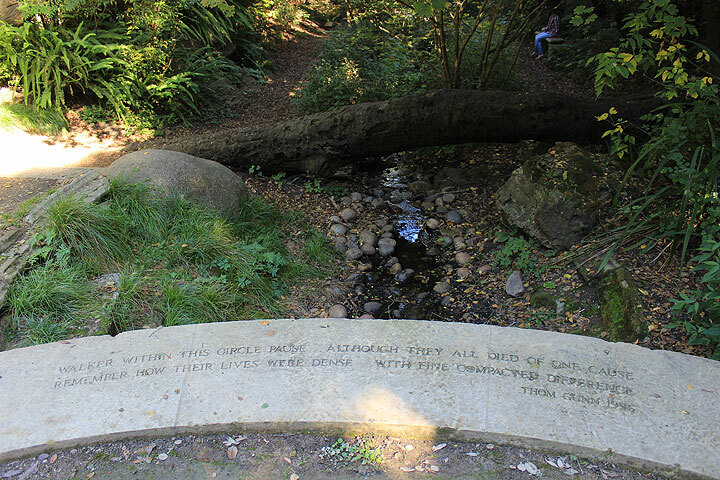 When the idea of Golden Gate Park was first hatched, in the mid-1860's, the whole world scoffed: Everyone knew that the western half of San Francisco was an arid wasteland of barren sand dunes, upon which nothing could be made to grow. 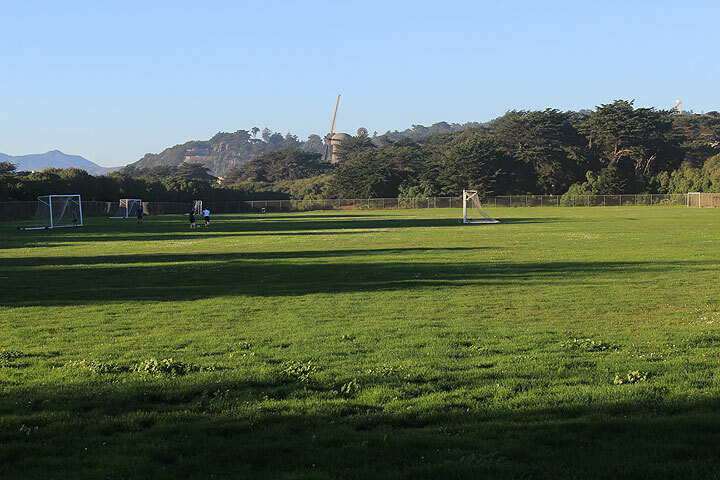 The Santa Rosa Press-Democrat, in 1873, wrote: "Of all the white elephants the city of San Francisco ever owned, they now own the largest in Golden Gate Park, a dreary waste of shifting sand hills where a blade of grass cannot be raised without four posts to keep it from blowing away..."
These soccer fields at the far western edge of Golden Gate Park were difficult to maintain as flat athletic fields covered in grass, due to problems with irrigation and soil drainage. So the Parks Department sponsored a ballot proposition that passed in 2013 that will convert these fields--not back to sand as one might assume would be appropriate, but to a type of artificial turf made from recycled tires! Fortunately, San Francisco ignored the conventional wisdom and set about the task of creating America's finest urban park. The two chief requirements were fertilizer and water; the latter was piped in and distributed with the help of the Dutch Windmill that still stands by the ocean near where John F. Kennedy Drive hits the Great Highway, while the former was provided in the form of the copious droppings generously bestowed upon the City's streets by the drays who were, until the 1920's, the mainstay of the local transportation system. Though no reliable estimate of the amount of horse-excrement collected for park fertilizer exists, the total undoubtedly ran into tens, even hundreds of thousands of tons. 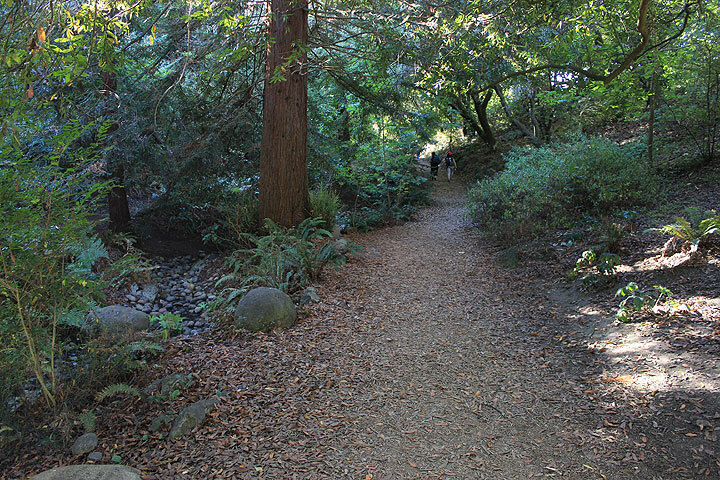 Entry to AIDS Memorial Grove in 2014, between Middle Drive and Bowling Green Drive. 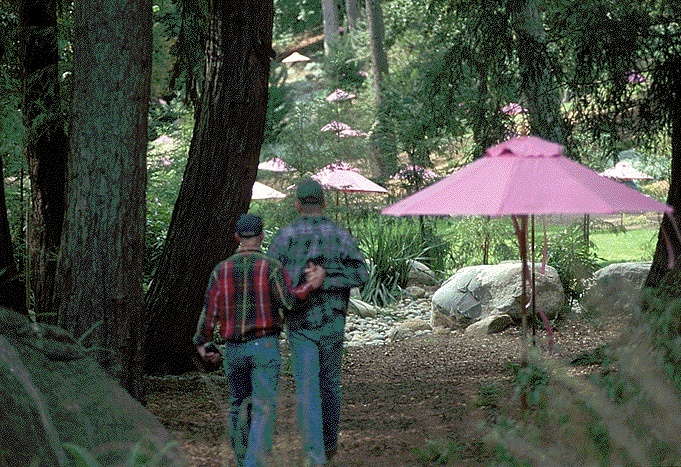 Path through the AIDS Memorial Grove, 2014, where once sand dunes and fresh water ponds filled the landscape.